This page replaces one created in July 2009 which was identified by a large colourful image of a street plan and bore the legend ‘transformation’. The intention of the earlier page was to maintain an independently sourced and fact-based flow of information for residents of Orchard Park, Hull, during the various stages of a proposed scheme of regeneration under Round 6 of the Housing Private Finance Initiative (PFI). On 22nd November 2010 the coalition Government announced the cancellation of all ‘pipeline’ (i.e. pre-contractual) Housing PFI projects. Although phases of public consultation had been carried out for the Orchard Park scheme, and other preparation work was well under way, an Outline Business Case had still to be submitted. The position meant government support was therefore withdrawn. The decision affected only housing, and then not across the whole estate. Some transformational projects have been completed or are going ahead (Orchard Centre, new shopping centre, Extra Care housing complex, Northern Academy). However, the original purpose of this page is over. Content and links (which may be in pdf format) continue to be presented as a community record of events between July 2008 and December 2010. The Communities and Local Government Agency (CLG) announces Round 6 of the Housing Private Finance Initiative (PFI). Each round is designed to allow the regeneration of council estates in deprived areas through funding in the form of PFI credits passed to local authorities by Central Government. Much of the money for PFI projects comes from the private sector (e.g. banks) as loans, which are repaid from Government resources typically over a 25 to 30 year period. A local authority may provide land. The CLG has a stragetic role and allocates PFI credits on behalf of the Homes and Communities Agency (HCA). For the sixth round, the selection process is tightened up. The CLG and HCA favour projects that should bring about tranformational change by social as well as physical regeneration of communities. Mixed tenure is intended to ‘reposition’ estates in terms of quality, diversity, reputation, and demand. A significant element of extra care for the elderly will be looked for. Refurbishment of existing homes is unpopular with PFI funders, although refurbishment is not necessarily ignored within a bid. The meeting of PFI criteria is more relevant to the bid than are local authority priorities. The PFI route begins with an Expression of Interest (EOI). If the EOI is accepted, an Outline Business Case (OBC) must follow. Costs of preparing an OBC may be in the order of £1m. Negotiations take place and a detailed Final Business Case (FBC) is produced. Cases have to be approved by a policy review group (PRG) and endorsed by HM Treasury before any procurement by the local authority can go ahead. The procurement process, by its very nature, is usually complicated and lengthy. Hull City Council Cabinet approves the submission of an Expression of Interest (EOI), or bid, for a share of credits from Round 6 of the Housing PFI. 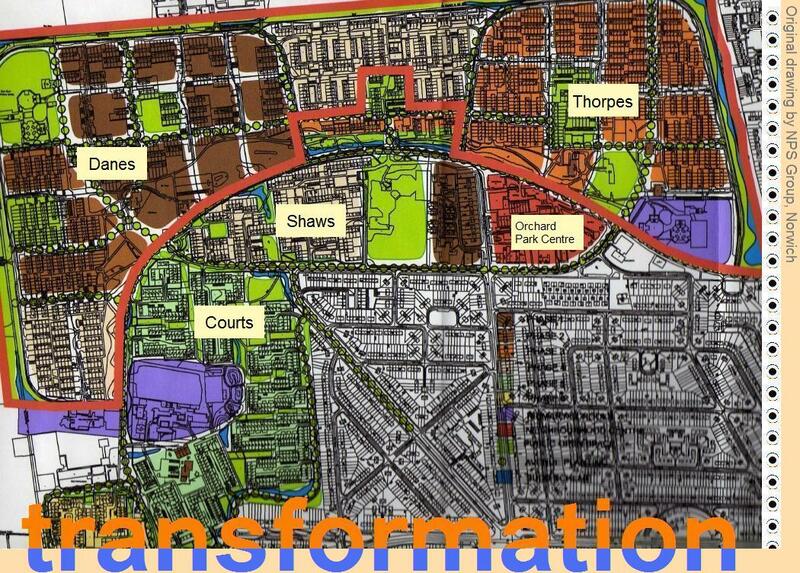 The bid document carries the title ‘The Transformation of Orchard Park – Shaping the Place, Creating a Fruitful Future’. There are 16 sections and 29 appendices to the file. A summary draft is subtitled ‘Harvesting the Future, Shaping the Place’. The EOI asks for £141.896m. In order to regenerate the whole of Orchard Park, two or three times that figure would plausibly be needed, but success is judged to be more likely if the figure respects the HCA’s notion of an ‘ideal’ bid (£100m). According to the bid document, transformation of Orchard Park will comprise three phases centred on the Danes (an area where a significant degree of demolition has taken place in recent years), the Thorpes, and an area between those two urban villages. In all, 752 council houses, 255 privately owned houses, and 33 council bungalows (1040 properties) will be demolished to make way for 1020 new homes in the private sector and 680 new homes for social renting (1700 properties, satisfying a mixed tenure ratio of 60:40). The net gain of private homes will be 765 properties while the net loss of social rented housing will be 105 properties. The Council also wishes to demolish all multi-storey flats in Orchard Park (4 high-rise tower blocks and 3 midi blocks). Removal of these buildings alone would mean a loss of 580 council units and 7 leasehold units. Together with the reduction through the proposed rebuilding programme, the loss to the Council rented sector will be 685 units of accommodation. The flats are deemed too expensive to bring to the Government’s Decent Homes Standard. Their demolition is complementary to the PFI regeneration scheme, not part of it. The cost of demolition of the flats, estimated in excess of £4m, would not be funded from PFI credits. Deadline for submissions of EOIs. The CLG receives Hull’s bid document. Ward councillors express concern about lack of involvement in consultation regarding the submitted bid (Minute 83). The Northern Area Housing Board receives copies of the bid document. Discussion between Hull City Council and the HCA results in the adjustment of credits allocation in principle to £159.25m. Hull City Council begins work on its first Housing PFI business case. The Council loses its Head of Housing, who is named in the EOI as Project Director. A PFI bid for extra care housing submitted to the Department of Health (DoH), for £23.4m to build 120 new units of accommodation in the city, is approved as an Expression of Interest. Some of the new units are planned for Orchard Park, a proposed site being Homethorpe where the Vernon House and Drake House tower blocks stood. The HCA hopes to finish the consideration of Expressions of Interest for Round 6 of Housing PFI in March which will allow the CLG to declare the results of the bidding at the end of April or the beginning of May. Up to £1.87bn in total is expected to be released. In all, 24 authorities submit bids to a total exceeding £4bn, more than twice the amount of credits available for this round. 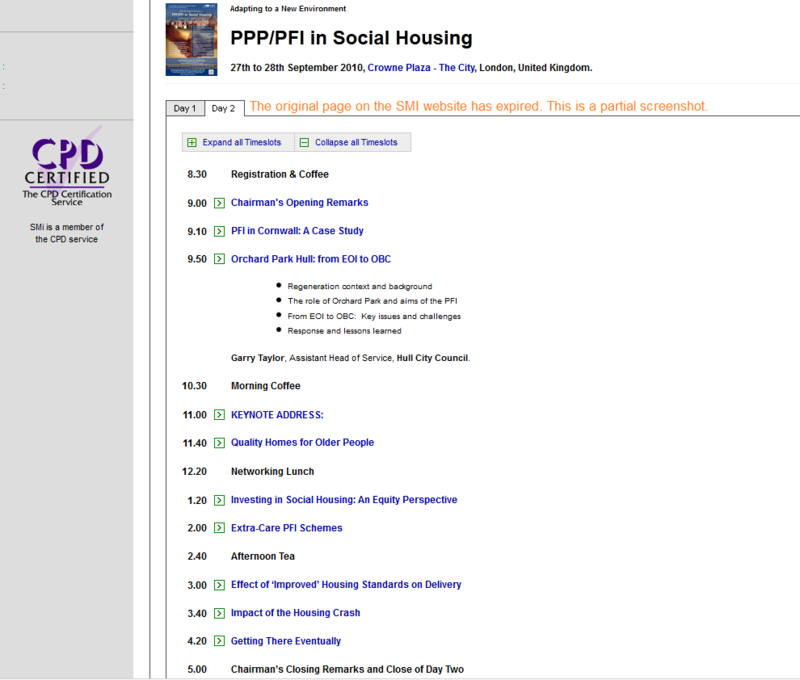 Previous Housing PFI rounds, the first in 1998, have allocated £1.3bn to 25 schemes (list). Housing Minister John Healey confirms the outcome of applications for Round 6. An anxious wait ends with good news for ten of the bidding authorities, who stand to share £1.7bn of PFI credits. One of the ten is Hull City Council. The PFI award allocated to Hull is reported as £156m. This amount is for council housing build and maintenance over the PFI period. There will be additional private housing investment drawn in – a figure of around £233m is mentioned. Manchester’s Grove Village, in 2003 the first Housing PFI scheme in the country to be contractually signed, was funded from a £37m bid to become a £100m project. The ratios are similar. First upload of this web page in the original style. In order to address a rumour mill that seemed in full production, a questions-and answers style concerns and comments section was started. Within the context of a wider programme of transformation for Orchard Park, planning application is approved to build a Northern Academy on the Princess Elizabeth playing fields (plan). that an Orchard Park PFI Advisory Board be set up to include ward councillors, community and tenant board members. A first newsletter is distributed by the Council to all homes within the proposed intervention areas (printing was delayed because of errors on the included map). A stop-off at Orchard Park by the Housing Minister is cancelled because of a required presence in Parliament. The Portfolio Holder for Regeneration and Housing Strategy responds to a written question regarding the consultation process surrounding regeneration plans for Orchard Park. The £14m Orchard Centre is opened. Adjacent to the new complex, the Orchard Park shopping centre has received partial remodelling. Diana Johnson MP for Hull North conducts an Orchard Park Housing Scheme Survey. The results of a survey by Diana Johnson MP suggests a core of opposition to a net loss of council stock as a result of transformation. Inaugural meeting of the Orchard Park PFI Advisory Board, organised by the Council in association with Gateway. A revision to the original PFI bid is presented. Changes include an 18% reduction in housing density and a shift in proportions of home sizes towards the provision of more 3- to 5-bedroomed properties. The ‘pepper-potting’ of estate design, preferred by many urban designers, is considered unlikely in favour of clusters (see the best mix for explanation of terms). Junior Housing Minister Ian Austin MP accompanied by Diana Johnson MP meets with ward councillors, the chair of the Area Housing Board, and representatives of Orchard Park resident associations at the Thorpes Resource Centre. The Minister takes note of concerns regarding the PFI proposals. Assemble a new package to include refurbishment of existing housing stock (internal and external), some demolition, some new build; environmental work. Residents to be asked which option they would prefer. Drop-in session where ward councillors hear views on issues of local concern, including the proposed regeneration of Orchard Park (results not released). Special meeting of the Orchard Park PFI Advisory Board (the third meeting within a week) to discuss the imminent phase of community consultation. Phase One of the consultation process. Information events are held at various venues. A comprehensive update with questionnaire is available at the events, and every home within Orchard Park receives a copy. A reminder letter dated 15 March 2010 sent to every home draws attention to the last three events. Of the three options motioned by the Advisory Board on 11 February 2010, Option 1 (which represents the original bid proposal, and which continues to stand as the basis for the agreement of PFI funding) was removed from the consultation exercise. As far as residents are concerned, Option 2 on the 11 February list is Option 1 during consultation, and Option 3 is Option 2. In other words, residents are asked to give opinions on a choice between a revised version of the original bid and a substantially different package, one of which will be submitted to the Homes and Communities Agency for reconsideration (the HCA is aware of the situation). A ‘none of the above’ option, to disown the scheme and miss out on PFI funding, was rejected by the Advisory Board and is not included in the consultation. Special meeting of the Orchard Park PFI Advisory Board to discuss residents’ concerns, as forwarded by representatives of the Danes and Thorpes, regarding the consultation process. Follow-up meeting of the Orchard Park PFI Advisory Board at which queries and issues raised on behalf of residents at the 8 March 2010 meeting are responded to. Residents of the multi-storey flats are visited during this period. A friend or relative may be present during the process. The Northern Area Committee hears a response on behalf of the Strategic Director Housing Investment and Renewal to Resolution 107 (08/09). This requests an explanation as to why its members and those of the Northern Area Housing Board were not consulted on the compilation of the PFI bid (Briefing Note). An assurance is given that every stage of consultation will be followed before the Outline Business Case is submitted in October 2010. The Rt Hon John Healey, Minister for Housing and Planning, stops off at a home in Laxthorpe accompanied by Diana Johnson MP and meets with four representatives of the community. Issues regarding the proposed PFI project, including the process of consultation, are discussed. The Orchard Park PFI Advisory Board meets to learn the responses from Phase 1 of the consultation process. Workshop at which the Advisory Board discusses aspects of Phase 2 of the consultation process. The Advisory Board meets for further discussion of Phase 2 of the consultation process. Diana Johnson MP receives a Parliamentary Written Answer (4028) regarding the continuation of the Orchard Park PFI scheme. National Audit Office publishes a critical report on PFI in Housing (e.g. twenty-one of twenty-five projects have experienced a cost overrun, and all were significantly delayed). In response, the Housing Minister Grant Shapps orders a review. The Danes Residents Association holds a public meeting to discuss current proposals. Sources report a turnout of over 200 residents. Phase 2 of the public consultation process. Comments received during Phase 1 (22 February – 20 March 2010) provide a basis for this next phase. Proposals are much more detailed. Affected residents receive one-to-one consultation. 80 houses built for sale. 85 houses built for sale. 165 houses built for sale (665 new build in all). 1020 homes built for sale (1700 new build in all). It is stressed that the proposed figures must in no way be considered as definite. The favoured strategy is now one of building new before demolishing the old. This avoids residents needing to ‘double decant’ (move away and then back) and reduces break-up of community. Future regeneration of Orchard Park will be considered from as yet unidentified funding sources. An Area Action Plan for the whole of Orchard Park is proposed. Meeting of the Advisory Board in which Phase 2 of the public consultation process is discussed. Revised scheme features as lead story in Hull Daily Mail. Residents in the proposed intervention areas are ‘door-knocked’ to bring their attention to the consultation process. Members of the Orchard Park Design Champions group visit the Ings estate and Woodcock Street area of Hull to look at new-build house types. The Advisory Board meets to learn the results of Phase 2 of the public consultation process. A draft Planning Brief for the Outline Business Case is presented. Preparation of an Area Action Plan (AAP) for Orchard Park moves a step forward with late 2012 being proposed as a date for adoption. A petition against transformation is circulated around the Danes village. The following numbers of signatures are gathered: Bondane, 43; Caldane, 63; Dibsdane, 23; Ealdane, 12; Gildane, 35; Hardane, 27; Isledane, 6; Dane Park Road, 3 (total 212 – includes some joint addresses). Phase 3 of the public consultation process takes place. A consultation bus tours intervention areas. This is the final consultation before submission of the Outline Business Case. The date originally planned as a Bidders open day for potential developers. Postponed to 7 October. Tenth meeting of the Orchard Park PFI Advisory Board. The consultation process is discussed and a working group formed to resolve outstanding issues. Hull City Council completes its appointments to the Orchard Park PFI project team. Outline planning application submitted for residential development on the site of the existing (closed) Orchard Park public house. The site is not part of the PFI scheme. An Outline Business Case (OBC) for the Extra Care PFI is submitted (see January 2009). Bidders Day for potential developers. Postponed from 10 September. The delegate list includes fifty organisations (other than Council). High attendance. Eleventh meeting of the Orchard Park PFI Advisory Board. The revised governance structure is announced. The Government’s Comprehensive Spending Review (CSR) aims to reduce public spending by £81bn. The planned cuts have significant implications for social housing, and it is known that the Chancellor is at best lukewarm to PFI in general as a means of delivery. However, there is no indication that the proposed transformation of Orchard Park will be affected other than, perhaps, by an increase in the requirement to demonstrate value for money. Councillors agree to the dissolution of the city's area housing boards, including the Northern Area Housing Board. In the House of Commons, Diana Johnson MP asks for reassurance regarding the Orchard Park PFI and the North Bransholme stock transfer. The reply from Grant Shapps, Minister for Housing and Local Government, is not specific (Topical Question 3 ). During the same Parliamentary questions and answers, the Housing Minister refers to the end of Housing Market Renewal Pathfinders (Column 1114). The decision may affect funding availability for ongoing programmes such as Hull’s Gateway Pathfinder (article). Hull City Council Cabinet approves submission of the Outline Business Case (OBC) for the Orchard Park Housing PFI bid, and demolition of the estate’s multi-storey blocks. The OBC describes the proposed scheme as comprising 500 new build social units funded by PFI credits and around 170 units for private sale, to be erected in the Danes and Thorpes urban villages. A total of 355 existing houses would be demolished to provide space for the new properties (demolition of the seven remaining multi-storey blocks is outside the PFI project). The scheme would be phased for minimum disruption to residents. Mention is made in the planning brief of the greater transformation of Orchard Park: The Orchard Centre (see 18 December 2009); the proposed Northern Academy (see 9 September 2009); the shopping centre (see 3 November 2010); the Extra Care units in Homethorpe (a separate PFI project for which the OBC was submitted in September 2010); and the development of an Area Action Plan (see 16 August 2010 – a possible date for adoption is now early 2013). Northern Area Committee receives a petition to preserve the Princes Elizabeth playing fields, site of the proposed Northern Academy (see 9 September 2009) (briefing note). Original date suggested for consideration of a planning application concerning the redevelopment of the Orchard Park shopping centre. A possible revised date is 1 December 2010. Following a Government announcement on 27 October 2010 that the Housing Pathfinder scheme is to end, the impact is felt in Hull [Hull Daily Mail article no longer available]. The Pathfinder funding mechanism is separate from Housing PFI and the Orchard Park programme should not be affected. The Government announces that it is cancelling all ‘pipeline’ Housing PFI initiatives, though schemes at the procurement stage are secure. Orchard Park’s Housing PFI project, at the point of submission of an Outline Business Case, is therefore not going ahead. Since the PFI route was once described as being ‘the only game in town’, and following the withdrawal of Gateway funding (see 17 November 2010), prospects for regeneration of the estate’s housing must now be somewhat low. The separate Extra Care PFI, including building on Homethorpe, is to continue. A plan to demolish the flats 4 high-rise blocks and 3 midi blocks, 587 units is still in place (relocation programme). The flats were not part of the PFI scheme but demolition of some of them would have been necessary in order to make space for new build. To retain the flats would mean their having to be brought to Decent Homes standard. Over 98% currently fail to meet the criteria. Depending on the scale of improvement and according to recent estimates, the work would cost between £18.9m and £23.5m. To demolish them would cost about £4.25m. As a result of suspension of lettings in early 2009, some 40% of the flats are currently empty and producing no rent income. Among the remaining occupants, a recent survey suggests that a majority are in favour of demolition. Bridgeman House stands adjacent to the proposed Extra Care homes site, and demolition of the block would perhaps be sensible before construction of the Extra Care complex started. North Bransholme housing stock transfer approved. A similar transfer of any Orchard Park housing stock is considered most unlikely. Orchard Park shopping centre redevelopment proposals scheduled to go before the Planning Committee. Meeting cancelled because of adverse weather; rescheduled for 13 December 2010. A meeting of the Orchard Park PFI Advisory Board is cancelled because of adverse weather. The meeting is rescheduled for 13 December 2010 but this too is cancelled. Orchard Park shopping centre redevelopment proposals approved by the Planning Committee. The Orchard Park PFI Advisory Board meets to discuss the implications of the Government’s decision to cancel the housing PFI project (see 22 November 2010). It is learnt that the total cost of PFI preparation and public consultation was approximately £450,000. The suggestion was made that the Board (with PFI dropped from its name) might continue to meet perhaps on a quarterly basis as a means of engagment with other projects and any housing developments connected with Orchard Park. Original document prepared by Brian Williams in February 2011.